I retreated into the world of happy endings this week – and treated myself by letting myself read the new (well relatively new) Sarah MacLean which I have been saving for a Time Of Real Need. 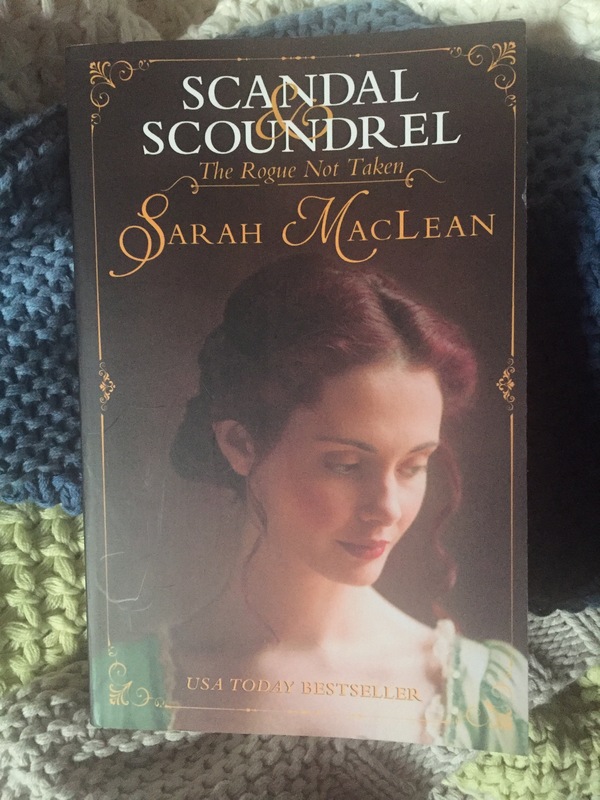 This is the first in her new series – Scandal and Scoundrel – and after the massive high of the surprise reveal and general excitement of the final book of the Rules of Scoundrels, I wasn’t sure this could live up to my massive expectations. And then I found out that the new series was inspired by celebrity scandals of today and got a bit worried. But I really didn’t need to. Sarah MacLean knows exactly what she’s doing. The cover model is just a bit to… meh. All downcast eyes and no personality – completely un-Sophie like! Sophie Talbot is the youngest of a line of scandalous daughters of a noveau riche peer. Her sisters revel in their notorious reputations, but she’s not keen. She’s the most retiring member of the family right up until she pushes her elder sister’s cheating husband into a pond at a party. He’s a duke – old family, old money – she’s not. Suddenly she’s the biggest scandal in society and facing being an outcast. So she makes a run for it. But she makes her escape it using the carriage belonging to the Marquess of Eversley, who’s fairly scandalous himself. He thinks she’s trying to trap him into marriage. She knows she definitely isn’t. But then Things Happen. I enjoyed this so much. The characters are engaging, the dialogue is witty and fun. There’s lots of proper plot – no wishy-washy misunderstandings that could be solved by one person asking the other a question. And just when you think it’s nearly fixed, MacLean throws in another twist to the tail. I was a little hesitant about one of these which happened towards the end of the book, but it was dealt with so neatly and resolved so satisfactorily that by the time the book was over I’d almost forgotten it had annoyed me. I was also desperate to read the next in the series which isn’t out until August, but I’ll try and contain my impatience. Get your copy from Amazon, Foyles or Waterstones, or for Kindle or on Audible. If you’re in the States, it should be everywhere fine, fine romances are sold (to quote Sarah Wendell.). Happy Romancing!